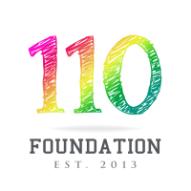 The name, 110 Foundation, teaches each child to give 110% and to put their best foot forward in all areas of their life. Our various initiatives provide sports programming, equipment, and mentorship to young athletes in underserved communities around the world. Our primary goal is to allow children the opportunity to maximize their potential, while promoting the importance of sports as a means to build character, learn discipline, and enhance self-esteem. Our potential long-term impact goes far beyond the sports performance of each child. Studies have shown that an engaged child is more likely to succeed, have high self-esteem, develop leadership abilities and be more willing to help others. With that in mind, we are confident that the children that participate in our programs will perform better in school and develop a strong sense of community which will undoubtedly have a positive impact on their home lives and strengthen their interactions with others. The opportunity to use sports to positively change the lives of so many young people is the heartbeat of our foundation.